Of all the books I read in 2014, the latest book by Jonathan Cahn was the most intriguing and if he is correct in his calculations, it is the most significant insight into what is happening in ‘America’ at this time. ‘The Mystery of the Shemitah’ is a follow on to his earlier book ‘The Harbinger.’ Let me start by giving you a brief summary of what he presents and them some more details of what is in the book. The ‘Shemitah’ is the seventh year, a year of rest. The meaning of the ‘Shemitah’ follows the pattern of the seventh day ‘the sabbath,’ a day of rest. So in turn, every seventh year becoming a sabbath year, a year of rest. Although it was originally intended by God to be a blessing, if unkept it became a judgment on Israel for not following the Lord’s pattern and law. Cahn then sees it being applied to America. He believes that it was intended for English colonies in America to follow the same Law of Moses. Unfortunately, the nation, after becoming the most blessed nation in the world, slowly, slowly but surely turned away from God. Cahn then looks at the greatest long term collapses in the stock market, as all them relate to the seven year cycle of the ‘Shemitah’ Finally, he turns his attention to what all this means for the future, which we will look at in the next Langstaff Letter. Then every seventh year was a sabbath year, which was to be kept holy and distinct from the previous six. It was a year devoted to the Lord (see Exodus 23:10-11). The Israelites were to let their fields lie fallow as the land observed its own sabbath. “So the world ‘shemitah’ covers both the seventh year and the last day of that year.” The last day of the month of Elud 29 (the last month of the Jewish calendar). Deuteronomy 15:1-2 declares at the end of the last day of the sabbath year in the month on of Elul, a sweeping transformation was to take place in the nation’s financial realm. Everyone who was in debt was released, and consequently the nation’s financial accounts were wiped clean. The original Hebrew commands even creditors to make a shemitah. Now, the word ‘shemitah’ is most often translated ‘the release’ or ‘the remission,’ which means the cancellation or reduction of a debtor or penalty. The shemitah is to years what the sabbath is to days, as it takes place every seven years. As such, it’s original intent was to be a blessing to Israel. 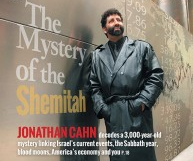 Jonathan Cahn then traces the history of Israel and the mystery of the seventy years (Jeremiah 25:4-11) when judgment fell on Israel in 586 BC with the Babylonian Conquest. The holy city became a burning ruin, the land was devastated and the people were taken as captive to a foreign land. Cahn declares that the seventy years of judgment were the unkept Shemitah’s from Israel past where Israel had failed to follow the Lord’s pattern and law. He goes on to declare – ‘”America’s founders prophesied that inasmuch as the new civilization would follow the ways of God, it would be blessed with the blessings given to Israel. And what they foretold came true. America became the most blessed nation on earth. By the twentieth century it had become the most prosperous, the most secure, the most revered, and the most powerful nation on earth. But at the pinnacle of its power and the height of its prosperity relative to the rest of the world, a metamorphosis began. The ‘Israel of the New World’ would reenact the apostasy and fall of Israel of the ancient world. America now began a progression that would end with the nation’s turning away from the God of its foundation. The metamorphosis was subtle at first but, in time, would grow more and more blatant and brazen. As did ancient Israel, so now America began removing God from its national life, from its culture, its government, and its public squares. It would ban prayer and the reading of Scripture from the instruction of its children. He looks at the majority of the greatest long term collapses in stock market history. (Listed in order of increasing magnitude) The crash of 2000-2001 (the Dot-Com Crash and 9/11), the Crash of 1916-1917 (the First World War), the Crash of 1973, (the Crash of Multiple Crises), the Crash of 1901-03, (the Struggle of Titans), the Crash of 1937-1938 (the Recession), the Crash of 2007-2008 (the Great Recession) and the Crash of 1930 – 1932 (The Great Depression). Since I am not a Hebrew scholar, I decided to seek advice from a trusted friend and one time colleague Dr Lance Wonders who worked with me in ACTS Bible School. Interestingly enough, Lance had been doing his own research prior to the publication of the ‘Mystery of the Shemitah’ and had come to similar conclusions and basically agreeing with Cahn’s dates and details. The one main difference was that Cahn put the emphasis on a warning about coming judgment in America, whilst Lance’s emphasis was on Israel discovering their Messiah. In our next Langstaff Letter, we will look at what Cahn has to say in this regard. It is fascinating and if it is correct, then it is a warning of things to come. So, look for the next Langstaff Letter as we examine further the mystery of the shemitah.